Box Text: Driven by a completely new and original storyline, James Bond 007: Agent Under Fire is a first-person action game that balances furious action and stealth tactics. An evil world organization has been replacing world leaders with their more docile clones and it's up to you to put a stop to it. As Bond, you'll encounter villains and allies, both new and familiar, detailed 3D environments, and spy-packed, fast-action gameplay. And don't worry, Q will provide you with all the innovative weapons, sophisticated spy-craft, and state-of-the-art gadgets that Bond fans expect. 10-21-2012 exonerator Box Text Driven by a completely new and original storyline, James Bond 007: Agent Under Fire is a first-person action game that balances furious action and stealth tactics. An evil world organization has been replacing world leaders with their more docile clones and it's up to you to put a stop to it. As Bond, you'll encounter villains and allies, both new and familiar, detailed 3D environments, and spy-packed, fast-action gameplay. And don't worry, Q will provide you with all the innovative weapons, sophisticated spy-craft, and state-of-the-art gadgets that Bond fans expect. 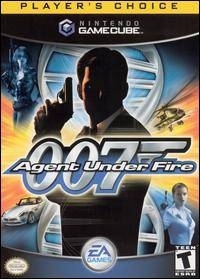 This is a list of VGCollect users who have 007: Agent Under Fire - Player's Choice in their Collection. This is a list of VGCollect users who have 007: Agent Under Fire - Player's Choice in their Sell List. This is a list of VGCollect users who have 007: Agent Under Fire - Player's Choice in their Wish List.